At Levine & Levine, our lawyers provide the highest caliber of representation and client service in personal injury, workers' compensation and criminal defense. Based in Independence, we work with clients across Cuyahoga County and Northeast Ohio. Our attorneys, Alan Levine and Katie L. Fitzsimmons, carry on a tradition first established by David Levine, who practiced law for more than 60 years until his death in 2014. 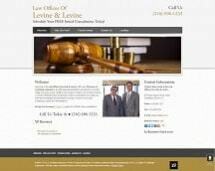 Alan Levine has practiced law since 1979. His daughter Katie joined the firm this year. In our personal injury practice, we represent clients in car, truck, and motorcycle accidents, as well as medical malpractice actions, and other injury claims. In every case, we make sure that the people we serve are treated fairly by the insurance company. We also help injured workers recover the workers' compensation benefits they deserve. In our criminal defense practice, we defend people facing felonies and misdemeanors in state and municipal courts. A large portion of our work involves defending people against OVI/DUI charges. In every case, we go the extra mile to minimize the damage associated with a conviction. Across all of our practice areas there is one constant: a commitment to client service. When you work with us you will work with one or both of our lawyers at every point in your case. Call 216-800-8120 to set up your free initial consultation. We will gladly meet you anytime, anywhere.